In and around Flattach there are many different breath-taking natural experiences to amaze you. How fantastic would it be of there was one card, with which you could enjoy a whole range of benefits. With the Kärnten Card you get free entry to over 100 excursion destinations and sights and have a genuine joker in your hands. 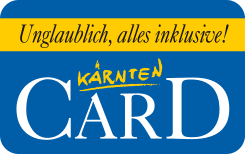 But that is not everything – the Kärnten Card also presents a whole array of superb bonus partners in the states of Carinthia and East Tyrol. These bonus partners ensure that you get to enjoy lots of benefits right across the region. With it, a holiday will be a genuine highlight for activity-oriented families, groups and those who just want to get the most out of their stay. Start your holiday today and get ready for a non-stop, unrestricted experience. What is it to be for you? A day in the high mountains above 3000m altitude? Naturally. The Mölltal Glacier is very close and with the Kärnten Card your access to the glacier realm is a steal. Without ski equipment, ascent to the Eissee mountain restaurant is free with the Kärnten Card. Or how about a trip to the Raggaschlucht? Located directly in Flattach it is one of the many inclusive highlights you get to enjoy here with us. Whether winter or summer, your first port of call should take you to us in Flattach tourist office, where you can purchase the Kärnten Card for the duration of your stay. Choose between our 1, 2, or even our 5 week packages and invest in a season card right away. The best excursion destinations in the state of Carinthia await – from museums, to outdoor pools, cable cars, leisure and adventure-packed offers – go for broke during your holiday and enjoy unbeatable benefits. Want to enjoy a variety of attractions and inclusive services? Then you ought to factor in a trip to Flattach for your next holiday and look forward to using your own Kärnten Card.